An entrepreneur at heart, Sumanto holds 17 plus years of progressive experience in the field of marketing, business administration, information technology, operations and training. Sumanto, along with a group of education enthusiasts, has been involved in the field of education and training for the past 17 years. The group began its journey way back in 1997 by imparting computer education in collaboration with the Electronics Trade and Technology Development Corporation Ltd. (ET&T), a Government of India Enterprise. Through this tie up with ET&T, they conducted training and certification programmes, for individual students as well as government and private organisations, in software, hardware and networking. They later moved on to the field of formal education through distance education by associating with Sikkim Manipal University. Over a span of 14 years, they have set up two training centres in Delhi and trained 8000 plus students in programs leading to graduation and post-graduation degree certifications. 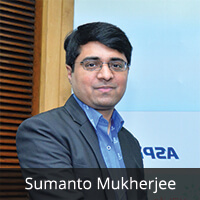 Sumanto currently is on the board of directors of several companies and serves as an advisor to a number of organisations.